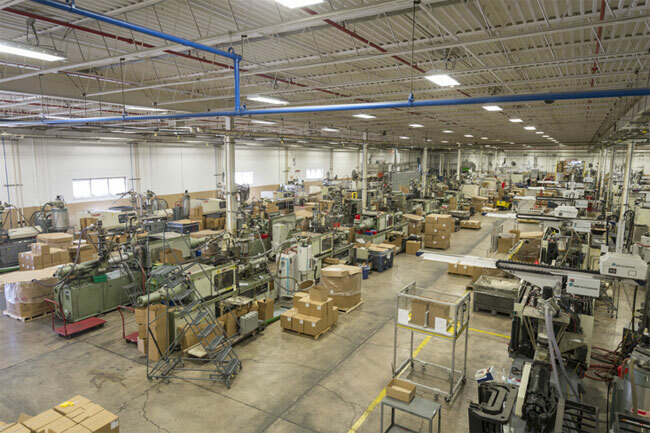 Our 125,000 square foot manufacturing plant contains over 118 state-of-the-art injection molding presses that run 24 hours a day/7 days a week. Automation abounds at Rodon, from our 3D computerized design capability and automated tool fabrication processes to our computerized and automated plastic injection molding machines and robots. 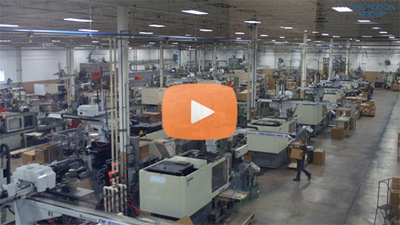 The entire Rodon facility is setup to produce the highest quality most economical plastic injection molded components in the industry. Our presses are managed by an expert staff that continuously evaluates the condition of equipment to ensure state-of-the-art performance. Every machine is equipped with a robot, either a robotic picker or a full-blown servo-robot. Parts are counted and boxed as they are made and automated conveyors index the box out of the way and install an empty box in its place. Baxter, our first adaptive manufacturing robot assists with completing repetitive production tasks and complements our highly automated facility. Each press is microprocessor-controlled and self-diagnostic, with capacities from fractional to 107 ounces, and clamping force from 46 to 720 tons. Quality control ensures that product specifications, color, and physical appearance are met at every step of the manufacturing process. Products can be 100% inspected using a KEYENCE Vision Inspection system. Parts requiring dimensional checks of a higher level can be inspected on our Mitutoyo QuickVision System. Quality control checks are also performed as components are sorted, weighed and sealed for stock, or prepared for Just-In-Time shipment. 78,600 sq. ft. of Manufacturing, Warehousing and Offices; Custom Designed and Built in 1987. 44,726 sq. ft. Additional Manufacturing and Warehousing completed September 1, 1992. 1 Vertical Band Saw Dake 24"
3 Surface Grinders Fully Automatic 8" x 18"
1 Surface Grinders Fully Automatic 16" x 32"
2 Surface Plates Grade A Ottavino 18" x 24"
3 Surface Plates Grade A, Crystal Pink Starrett 18" x 24"
2 Surface Plates Grade A, Crystal Pink Starrett 36" x 24"
2 Surface Plates Grade A, Crystal Pink Starrett 36" x 48"
4 Digital Height Guide 18"
3 Digital Height Guide 12"
3 Stations equipped with Master Cam Level 8, CNC Software Inc.